So many of my favorite food memories come from our family lake house. Growing up, we spent just about every weekend there. Over the course of many weekends spanning many years, I learned to cook from my mom, my dad, and my aunts. There was a TV at the lake house, but there wasn’t any signal, so the only time we watched it was to pop in an old cowboy movie on VHS from the big collection in the corner. Other than that, we were on our own to entertain ourselves when we weren’t out on the water or doing chores (which my dad might consider entertainment). So naturally, we spent a lot of time in the kitchen. And I learned to make so many things from scratch, because we had the time to do so. And because the nearest grocery store was very far away. One of my favorite things that my mom would make in the summers was homemade ice cream. There was an old ice cream maker at the lake house, the kind that you had to pour ice and rock salt in. If we were lucky, my mom would sit out on the porch and churn homemade ice cream in the ice cream maker after dinner. 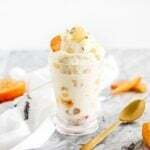 And if we were really lucky, it would be peach ice cream, made with fragrant, juicy peaches that we’d picked up from the roadside stand on the way in. We’d have to eat our ice cream fast, before it all melted in the Texas heat, but it was the best ice cream on Earth. Fast forward a few years, and ice cream is still one of my favorite desserts. I don’t make it at home very often, but when I do, I always wonder why I don’t do so more. 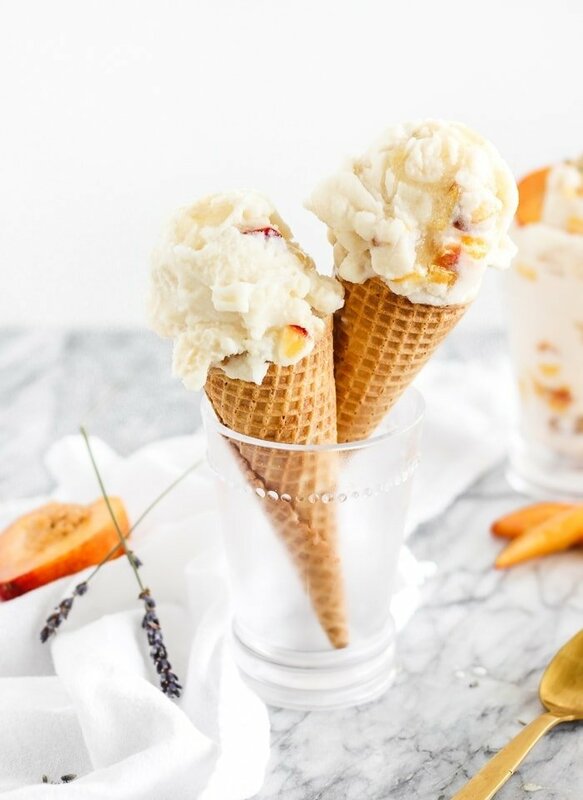 This honey lavender peach ice cream is a twist on my mom’s peach ice cream, sweetened with honey and infused with lavender for a soft, floral flavor that tastes so good with sweet summer peaches. All blended into a creamy vanilla base. 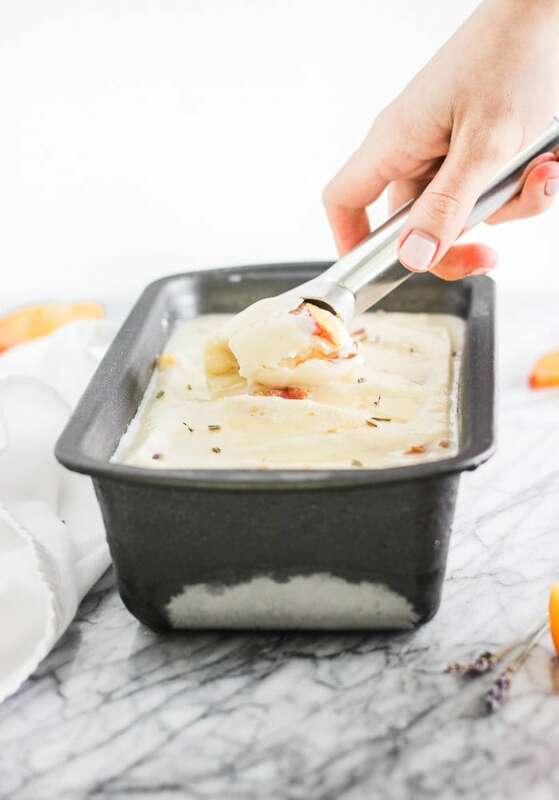 If you love lavender and ice cream as much as I do, you’ll love this honey lavender peach ice cream. It’s easier to make than it sounds, although it does take a little time to infuse the milk with lavender, then to cool it down, so plan ahead. 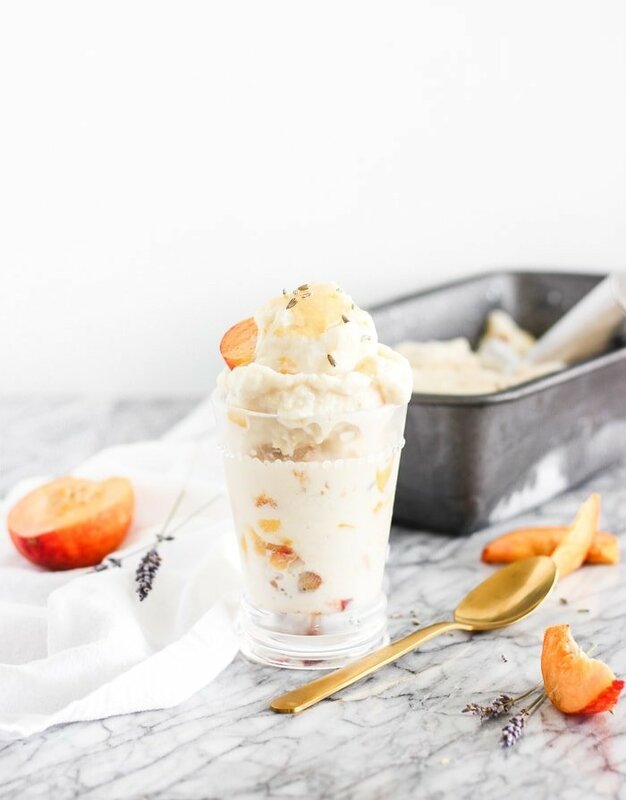 The creamy, delicate flavor and soft serve texture with chunks of fresh summer peaches is definitely worth the wait! 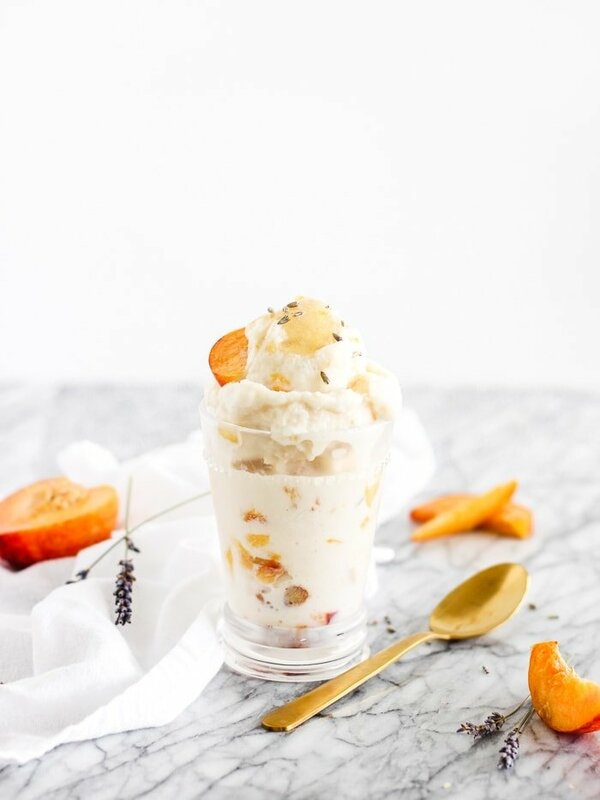 I recommend eating this honey lavender peach ice cream right away after it firms up for the best taste and texture. Once it goes into the freezer, it gets a little to hard and icy because of the fresh peaches and lack of heavy cream. Though it will still taste good if you do decide to freeze it. Just let it thaw for a bit before trying to scoop it! Infuse milk with lavender. Add milk and lavender to a saucepan and bring to a low simmer for 5 minutes. Turn off heat and chill milk in the refrigerator. Place peaches in a bowl with lemon juice and honey. Let sit for an hour. Strain lavender buds from milk and discard. Add milk to peach mixture. Add salt and vanilla. Enjoy immediately, or place in the freezer to firm for up to an hour before scooping. I need to give you the recipe for my Mother’s Lemon/apricot sherbet. it is so good but this recipe sounds delicious. That sounds so good. I would love to try it!